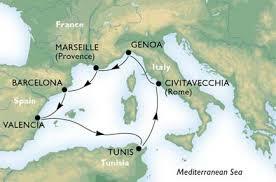 A cruise around the Mediterranean? Why not? I love the idea of hop-on-hop-off and being American it meant that we could tick a lot of boxes in a short time. It makes a perfect short break or longer holiday for numerous reasons. The pleasant weather, diversity of cultural experiences and some of the finest shopping in the world makes towns and cities bordering the Mediterranean Sea some of the best destinations anywhere. One of the premium delights of this area are the numerous and delectable culinary opportunities. The mild climate encourages an enticing array of local fruit and vegetables to grow, which coupled with plentiful fishing and traditional farming methods result in superior ingredients which combine to make globally renowned dishes. Choosing which places provide the most impressive eating experiences is difficult, but repeated recommendations from delighted diners as well as the opinion of knowledgeable experts, puts the regions of Valencia in Spain, Compania in Italy and Provence in France at the top of the list. Valencia is legendary for its simple yet tasty dishes, sourced from the surrounding countryside; the particularly lush and well irrigated La Huerta. A particular speciality is Valencia rice, which makes the perfect base for paella, a signature Spanish dish which originated in this region. Fruit and nuts grow well in La Huerta, resulting in a selection of mouth-watering desserts, including a comprehensive selection of nougats. Close proximity to the Mediterranean means seafood is abundant and a significant part of many local recipes. Shell fish, flounders and anchovies are all highly prized. With so much to choose from, it’s no wonder this part of the Spanish coast enjoys some of the finest dining in the country. Italy is well-known as a country of exciting and diverse food, with each of its regions offering something unique and delightful. Campania stands out not only because of the high quality and diversity of its ingredients, but for the variety of dishes and styles which are incorporated into local cooking. Neapolitan recipes make use of fresh fish, whilst elsewhere in the region dishes using cheeses (particularly buffalo mozzarella) are popular. Presenting a fusion of all that’s great about Italian cookery, Campania is a rising star in the world of gastronomy. France’s status as one of the leading culinary nations in the world means any food from the country is going to be spectacular. Provence is synonymous with superlative olive oil, bountiful fresh produce and tasty herbs. Garlic grows particularly well here and enjoys prodigious use in dishes. Goat’s cheese and Camargue rice are celebrated local foodstuffs, being combined artfully to create rich and enticing choices. Whether you venture into local restaurants to delight in the finest local flavours, or sit back and enjoy all the amenities aboard your cruise ship, you will be guaranteed a delightful holiday with many happy memories. This entry was posted in Uncategorized on 26 March, 2012 by adminfw.